Boot Buddy Ltd’s Car Boot Liner Defies Convention. Auto Express Recommended. Boot Buddy Ltd today reflected on its release of it’s tailor made car Boot Liner over 10 years ago, which was in development for several years to reach it’s current form.. 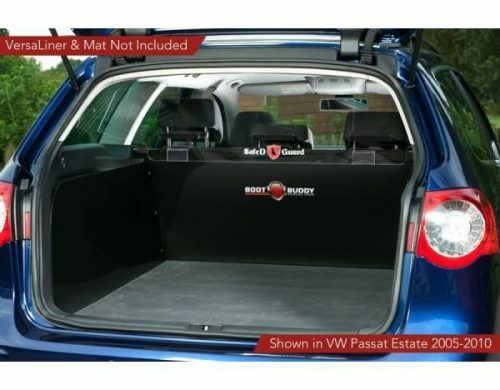 The main aim was always to offer the maximum protection for every boot space including estate, hatchback, and sports cars.Unique compared to all other boot liners is it’s free standing, needs no fixings to car, not even Velcro! Wipe clean in situation to save hours of cleaning. These products are already saving owners car boot from dog hair and mud, by protecting base, boot sides and full height of the rear seats. Fold out bumper protection as an extra can be added…. and by defying convention and avoiding traditional boot liner fabrics our car boot liner get’s excellent customer feedback. So as a welcome breath of fresh air, the Boot Buddy Versaliner ( Boot Liners) is custom made for every different car, is made from semi rigid wipe clean materials. Offering full boot space protection without and fixings or damage to the car. They have boot liners still doing their job 10 years after fitting. New boot liners can be extended in vehicles whose back seats fold flat to utilize the whole load area of suitable cars. There are two options, a load liner, or an extension kit to fit within the Versaliner. Boot Buddy Ltd chose to make this move because we started making watertight rubber trays for our own needs, but kept receiving requests for a high sided version. We sourced various materials to make a high sided version. Since then several product improvements have been made to improve the boot liners and the high level of protection they now offer.We are still unique in the materials used in our products, due in part to the difficulty in manufacturing with our semi rigid plastic boot liners and clear, polycarbonate dog guards.. Boot Buddy Ltd has been in business for over 13 years, being established in January 2006. Since Day 1 it has always aimed to manufacture bespoke car boot protection against dogs and mechanical damage..